-공 연 명 : 2017 SHIN HYE SUNG FANMEETING "五.月.之.戀 오. 월. 지. 련"
설렘이 가득했던 그해의 5월을 기억하시나요? 그 기억속의 따뜻한 순간들을 다시 꺼내어 보는 시간..
-원활한 진행을 위하여 1인 4매로 구매를 제한합니다. 공식예매처가 아닌 다른 경로로 구매, 취득하신 티켓의 취소나 환불은 불가능합니다. 이로 인해 발생한 문제에 대한 피해와 책임은 당사자에게 있으며 제작사와 협력사, 예매처는 책임지지 않습니다. -불법 거래된 티켓은 사전통보 없이 취소 처리되며 공연당일 티켓을 소지하더라도 입장 불가합니다. -불법거래 티켓 판매자는 고발 조치를 취할 예정이오니 이에 따른 피해가 없도록 팬 여러분의 자발적인 협조 부탁 드립니다. ※ 좌석배치도와 배송일정 등의 세부 안내사항은 예매오픈 시 공개될 예정입니다. -Foreigner / 外國人 메뉴를 통해서 구입하실 수 있습니다. -글로벌페이지를 통한 예매는 공연 당일 현장 매표소에서 현장수령만 가능합니다. -예매자의 신분증 또는 예매내역서로 티켓을 수령하시기 바랍니다. 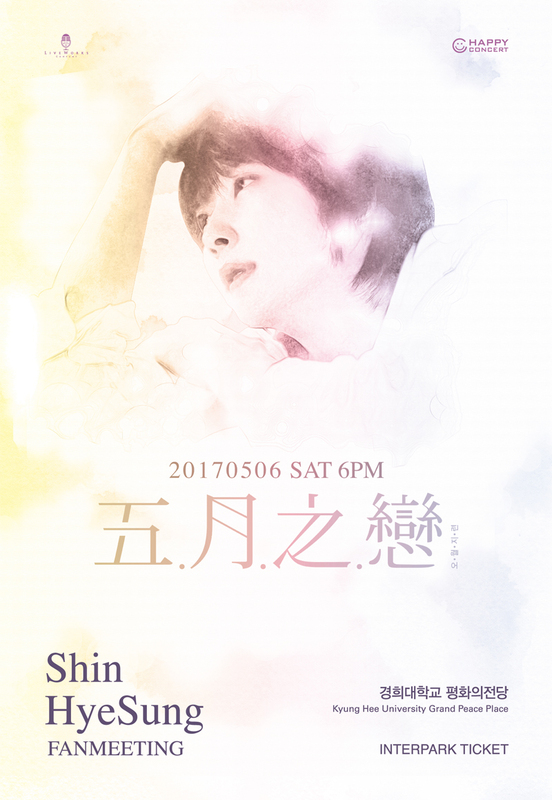 2017 SHIN HYE SUNG FANMEETING "五.月.之.戀 Love of May"
- TITLE: 2017 SHIN HYE SUNG FANMEETING "五.月.之.戀 Love of May"
- DURATION: Approx. 100 min. Do you remember the days of May with full of excitement? SHIN HYE SUNG's "五.月.之.戀 Love of May". - All seats are pre-assigned. - Ticket purchase is limited to 4 tickets per person. - 2017 SHIN HYE SUNG FANMEETING <五.月.之.戀 Love of May> is exclusively sold at INTERPARK TICKET. No refunds or cancellations can be made for the ticket purchased through any third party seller. and the event organizer/production company/ticket agency will not be held responsible. - Illegally traded ticket will be cancelled without prior notice, and admission will not be allowed. - Illegal ticket sellers will be prosecuted. We would appreciate your voluntary cooperation. ※ Details including Seating map will be updated with TICKET OPEN. Please make a reservation through "Foreigner / 外國人" menu. Ticket pick-up is only available at the box office on site on the day of the show, if the ticket is booked at INTERPARK TICKET - GLOBAL page. Please bring the booking details with confirmation number or ID of the purchaser to pick up the ticket. 2017 SHIN HYE SUNG FANMEETING "五.月.之.戀"
‐公演名　：2017 SHIN HYE SUNG FANMEETING "五.月.之.戀"
2017 SHIN HYE SUNG FANMEETING "五.月.之.恋"
- 演出名: 2017 SHIN HYE SUNG FANMEETING "五.月.之.恋"